Almost a year after the International Trade commission (ITC) announced an affirmative determination in its preliminary investigation of anti-dumping and countervailing claims made by US engineered hardwood flooring manufacturers’ against China, the case is heading for a final determination in November. The ITC has held its final hearing of the investigation where both sides stated their case for the last time in public. Floorcovering weekly produced an excellent article for its readers (ITC holds final hearing on imported Chinese engineered wood) which summarized the event. What I found particularly interesting were the comments from both sides in the case; the US manufacturers represented by the Coalition for American Hardwood Parity (CAHP) and US distributors and importers represented by the Alliance for Free Choice and Jobs in Flooring (AFCJF). • A large US manufacturer claims it has had to lay off one third of its workforce and that capacity utilization sits at 43%. I believe any lay offs and capacity utilization reductions is mainly due to the catastrophic decline in the US housing market resulting from bad decisions by US banks. • The playing field has changed. It is a race to the bottom and is driven by something that did not exist five years ago and that is imports of Chinese products. Chinese products have been around for the past 10 years including the time of the housing boom in the early to mid nineties.This would have been a better time to complain as at that time the allegations made in this case were much closer to the truth. But they're right in one aspect. The playing field has changed - the global playing field that is - and we need to be aware of that. • Chinese cloning of creative product and illegal logging all contribute to the increase in sales of Chinese products in the US. To blame the Chinese for cloning is not really fair. All US manufacturers closely monitor the new product introductions of their domestic competitors and if successful they happily clone them, sometimes they even used China to do it. Thinking ahead, if US manufacturers export to China's growing floor covering market they will surely ship products compatible with existing consumer preferences there. Is that a form of cloning? • Chinese suppliers are more flexible regarding minimum volume requirements and therefore make private label programs easier and more viable. Chinese manufacturing methods allow them to make smaller product runs efficiently. • Chinese products complement rather than compete with those of US manufacturers. The vast majority of Chinese products have a sliced veneer face which resembles solid products whereas the vast majority of US manufactured products have a peeled veneer face and this gives a totally different visual. So there are the major comments from both parties. I remain unconvinced that the US manufacturers have a case. It is interesting to note that whilst the importers and distributors have received widespread support from their peers, many of whom were in attendance at the hearing, the two largest US manufacturers appear to have maintained a neutral stance throughout the proceedings. A year ago I posted here and said it would be very interesting to see how it all falls out with the one certainty being it will be a win for the lawyers. I still stand by this comment. When the final ruling is announced (and both sides are appearing optimistic following the latest amendments to the duties) lets hope it is not a pyrrhic victory for whoever prevails and in particular for our industry, and lets hope we can now move on to more critical, strategic planning. While this battle has raged, the US flooring and housing markets have shown few signs of recovery but some markets abroad have grown at unprecedented rates. A prudent long-term strategy would be to use the time and energy we've spent on this battle to study the shifting market conditions and explore opportunities in exports and strategic partnerships. Ironically, the biggest and fastest growing market is China where the demand for floor covering is growing expotentialy with its unprecedented construction schedule. China cannot keep up with its demand for wood. Many sawmills in the Western U.S. and Canada are are now exporting up to 30 to 40% of their production to the fast growing Asian market. Canada can't keep up with the call for wood from China. While that is largely softwood, the Chinese construction boom that is absorbing great quantities of softwood will also need flooring. Eventually hardwood flooring produced in China will have to stay in China to meet that demand and China's demand for hardwood and their flooring import market will grow. Will you be ready? Nothing stays the same forever and that includes floor covering markets. I am happy to report that after ten years in the B2B trenches, we are ready to conquer new ground with new web services that all flooring companies should support. On September 21st 2011, the Flooring Industry B2B association (www.fcb2b.com) held its annual meeting in Atlanta. The meeting combines a technical agenda with an industry-wide marketing agenda, and is a special place where competitors come together as friends in an effort to improve the flooring industry. In my previous blog post, B2B – an old term but a new opportunity for the flooring industry, I complained about trying to light a fire with an old wet match, which is what it is like when you try to excite the iPhone crowd with old terms like B2B. Well, regardless of the terminology, B2B is evolving to meet demand for real time applications. The new vision for B2B flooring web technology. • Any supplier that supports the “stock check web service” can offer real-time inventory information to anyone they choose – retailers, designers, architects, distributors, and even consumers. How is this different than the old vision? 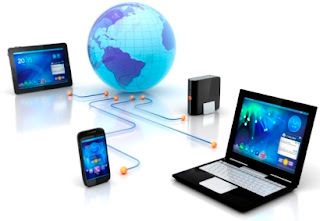 The old vision was based on moving batches of data from one computer to another which is called Electronic Data Interchange (EDI). 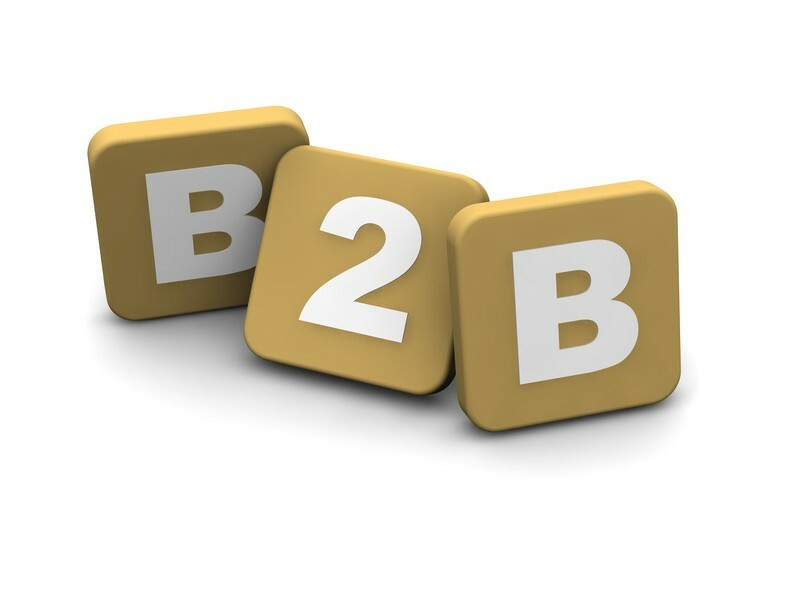 The terms B2B (business to business) and B2C (business to consumer) are old, but the concept is still viable. Web services satisfy today’s (and tomorrow’s) real-time B2B and B2C applications. (President and Executive Director of fcB2B, respectively) who have effectively and generously managed fcB2B for years. They have suggested that 2012 be the final year for augmenting the older EDI-style B2B programs and the first year in which we concentrate our efforts on implementing web services. The industry attendees expressed full support for this direction. • The EDI-style B2B programs include Product Catalogs, Purchase Orders, Order Acknowledgments, Advance Shipping Notices, and Invoices. Most of these programs are complete, with only minor revisions slated for 2012. The idea is for the industry to support these programs “as is” for as long as they are purposeful for the thousands of current users. • The EDI-style Product Catalog remains problematic, as it relies on huge batches of product information that varies greatly based on the type of product and the information available at each supplier. The industry has agreed to program a final set of improvements, primarily to deal with hard-surface products that require a Stock-keeping-unit (SKU) based scheme. Many flooring systems were developed for carpet and use a “style/color” scheme that (a) does not work for hard surface, and (b) is out of step with nearly all other consumer product cataloguing techniques. • Web services can replace all of the functions of the EDI-based programs, but there are no plans to discontinue support of the EDI-based programs. Each company can decide which path is best for them and their customers. I fully support this exciting new course. The suppliers and the software companies have a lot of work to do to make this a reality. Some of the work has already been done. At my company, Dancik International, we have deployed a successful set of web services for a large manufacturer, and our customers are beta-testing a new version of our popular Décor 24 web portal, which has been completely rewritten as a series of web services. Shaw Industries has announced that their “stock check” web service is available for software companies to access. The flooring industry competes for a piece of every consumer’s disposable income. Web services will allow us to be competitive with other industries that are already embracing this consumer-friendly technology. I look forward to your comments. If you are not yet actively supporting the B2B movement, please visit the fcB2B web site http://www.fcb2b.org/membership.php and see what you can do to help. Thank you. 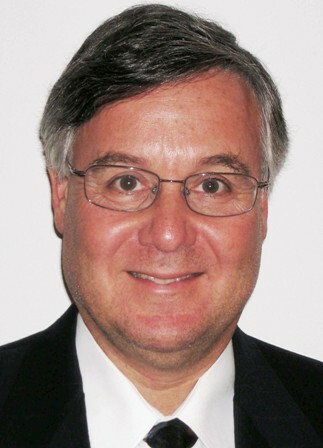 Mitchell Dancik is Chairman of the Board of Dancik International and a consultant for the Floor Covering Institute. Stand on the side walk outside of some retail flooring stores and look at the windows. What do you see? Unfortunately, sometimes you see the backs of flooring displays or maybe static branding and sale signage. Retail visual design experts say that windows need to drive traffic to the store, draw the consumer in and make passersby think of you when they need new flooring. Five important design tools to make people stop or remember your store are color, angles, movement simplicity/repetition and imagination. This post was prompted by two events. On a recent road trip I passed several unmemorable buildings that turned out to be flooring stores. I remember reasoning at the time that maybe there was only one flooring store in town and this retailer felt he didn't need to make a statement. Then I read a fabulous article on the Surfaces blog site, Five Powerful Display Tools by Linda Cahan. Linda is a retail visual design consultant who will speak at Surfaces and she gives a great overview of how important it is to incorporate those five important design tools: color, angles, movement, simplicity/repetition and imagination, into store windows and signage. I highly recommend her article which reminded me of the recent road trip and inspired me to look for some good examples of great and no so great windows. Here's an example of a window that, while colorful, is lacking a branding message. 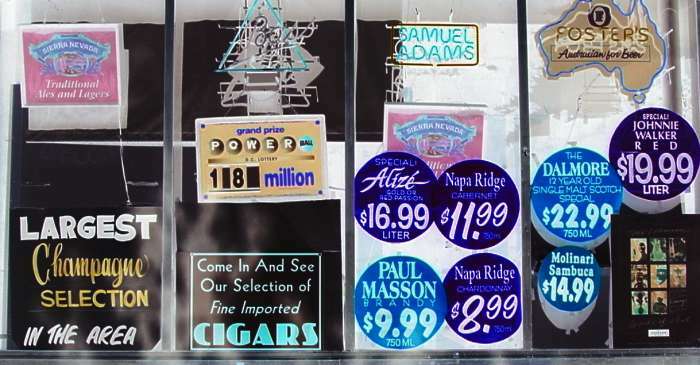 This example from the New Sales Ideas website illustrates how a cluttered window filled with sales signage can be confusing and forgettable. The message this conveys is mostly about their lack of imagination and design expertise. If you are in a fashion based industry like flooring covering, that might not be the best message to convey. I have to say that the stores I saw on the road trip didn't even have color in the windows to draw attention; one had their windows totally covered. 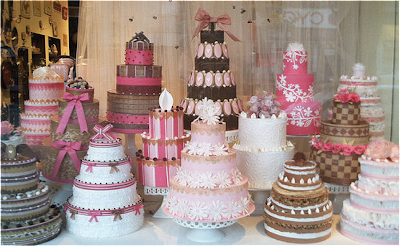 In contrast, would you walk past the store window below without getting the message that they are passionate about cakes! This example from I Do Windows leaves no doubt that this store sells cakes and they seem to have some pretty inspiring ideas. I'd remember to visit these people when I needed a fabulous creation, wouldn't you? I know that store owners feel they have no choice but to cover windows in order to make the most of the interior showroom. I've seen backs of displays, windows painted black and even plywood covering some flooring store windows. I confess to doing it myself many years ago but it wasn't the best use of that space then and it sure isn't now. I hope this prompts you to take a critical look at the message your windows and the outside of your store is sending to the consumer. I'm not an expert on the subject, but I do know that advertising is expensive and uninspiring windows seem to be a lost opportunity. I'd love to see some examples of your inspiring window displays and signage. Carpet's shrinking market share - is appearance retention to blame? We all understand that carpeting is losing share of the floor covering business – once nearly 80% its now approaching 40%. We hear all sorts of reasons for this. Those close to the manufacturers put the blame squarely on consumer preferences. I can’t accept this. Years ago the industry used to drive consumer preferences much like the women’s fashion industry does. Since when has good taste and designer expertise been trumped by popular opinion? The mill marketing people, convinced that retail salespeople (Depot and Lowes?) can’t sell, use focus groups to tell them how to market carpet where women tell them that they shop with their fingers - as if anyone of us couldn’t tell them that. The women say warranties are important so the manufacturers make soft hand carpet with unbelievable warranties. So now we have a new generation of shoppers who read 20 year wear, unlimited stain and lifetime urine warranties and they actually believe that they can treat carpeting like ceramic, allowing the kids to have juice boxes and eat on the carpeting whereas an older generation realized that carpeting is fabric and should be treated as such.This is the reason that we have lost a gigantic share of the flooring business. Appearance retention was always the hallmark of quality carpeting. Consumers have had it with carpet that “uglies out." The trend now is toward the new friezes—high-pile, loose, shaggy carpets. Retailers tell me that their reps tell them these loose high pile carpets will perform. In my discussion groups where I bring up the fact that shags have somehow morphed into friezes - I hear the term so often that I am giving in to the notion that the mills have renamed shags - the question remains, what happened to the real frieze known as the carpetman’s carpet? The next issue is construction. I am not a technical guy, but I’ve always been taught the greater the turns per inch (TPI), the denser the carpet and the lower the pile, the heavier the denier, the better the appearance retention - that’s how long carpeting looks good. Sounds like the original frieze to me. Since when do none of these things matter? Am I wrong and the fiber reps aren’t lying to the retailers that soft, high pile in a loose construction will perform well? Maybe the carpet manufacturers have already realized the error of their ways and to make sure they don’t sell too much they’re only making inky dinky samples from which no one could possibly make a color decision. Once when we were proud of carpet, retailers bought 18” by 27” and 27” x 54” samples for customers to feel, caress and lay down to see the beauty of American carpeting. We deserve what we get and marketing people in compliance with their masters are seeing these claims turning around to bite them. It’s a good thing that the carpet mills are selling hard surface, because we will continue to lose share in a product that once was a consumer best buy, something that beautified American homes in less time and for less money than anything else on the market. 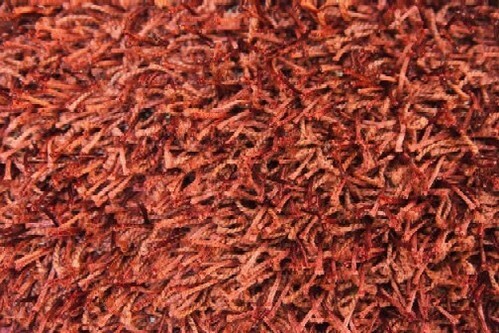 Rest in peace carpet. Warren Tyler is a professional speaker, retail consultant and educator as well as author of several books, CDs and DVDs targeted toward flooring retailers and salespeople. He is also a consultant with the Floor Covering Institute. Read Warren's column at Floor Covering News. As I finished the most recent report on floor covering industry statistics I wondered why hard surfaces sales are on the rise this year considering all the negative news about the economy and our industry's general condition. One of the impost important trends in the US floor covering industry is the continuing increase of hard surface's share of overall floor covering. As of September 2011 hard surface had claimed an estimated 41.4% share which reflects a 10% increase in share over the past decade. Manufacturer sales (shipments minus exports plus imports) of hard surface flooring increased over the first three quarters of 2011, while carpet and rug sales declined. Dollar sales of hard surface flooring increased by an estimated 4.3% over the first three quarters and square foot sales could have risen by 1.9%. Meanwhile, we estimate that carpet and rug sales declined 0.7% and 5.0% respectively over the same period. 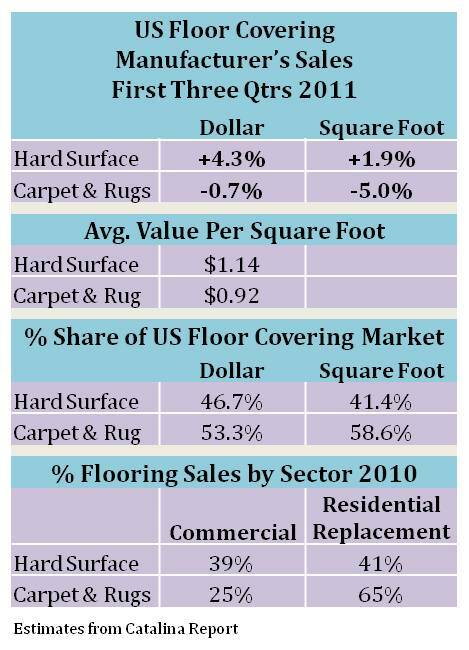 These statistics are in our latest floor covering industry publication, the September issue of the Catalina Floor Coverings Quarterly Update. Hard surface flooring has been taking share from carpet and rugs for over a decade. But what has caused had surface flooring sales to grow in 2011 when unemployment remained high, consumer confidence fell and the house market remained depressed? 1. Flooring's stronger commercial markets are boosting hard surface sales. Perhaps the most important factor driving hard surface flooring sales is its tie to the commercial market which is stronger than residential replacement which is where the majority of carpet is sold. In 2010, some 39.0% of hard surface flooring was sold for commercial applications compared to only 25.0% for carpet and rugs. Conversely, 65% of carpet and rug sales were sold for residential replacement and consumer spending for floor covering declined 3.6% in the first half of 2011. This hurt carpet sales. Only 41% of hard surface products flowed to residential replacement sales. 2. Home owners are staying put and showing increased preference in longer lasting flooring. Another driver is that people are staying in their homes longer now. Since the housing "crash," housing turnover has slowed with declining home prices and tightened credit standards. These non-movers have increased their preference for longer-lasting flooring products creating a trend towards hard surface flooring. During 2011, some two-thirds of homeowner floor covering replacement jobs could utilize hard surface materials. This is up from about 60.0% in 2005 and only 52.0% in 2001. 3. Consumer preferences are turning to natural wood and stone looks. The shift to hard surface also reflects the consumers' increasing preference for wood and stone looks. This gave a boost to the relatively high-priced wood and stone flooring prior to the recession. Currently, consumers are turning to ceramic tile and resilient flooring to satisfy their desire for wood and stone looks at lower prices. Ceramic tile manufacturers have expanded their lines of porcelain tile with stone looks and even introduced wood plank looks. At the same time, resilient flooring manufactures upgraded their product offerings with luxury vinyl planks and fiberglass backed sheet vinyl. 4. Carpet's price advantage is narrowing. Finally, the price advantage of carpet has narrowed. We estimate that the average value per square foot (manufacturer prices) of hard surface flooring increased by 1.8% in the first three quarters of 2011 versus 4.5% for carpet and rugs. Hard surfaces flooring's average value per square foot sold is $1.14 while carpet and rugs is $0.92. The sharper increase in carpet prices reflects stronger increases for material inputs. 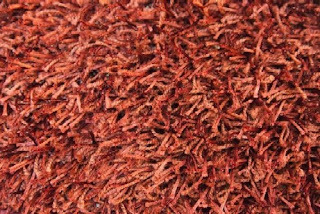 Carpet fiber prices increased by about 10.0% over the past year as oil prices rose while ceramic tile and wood flooring material costs have been flat. Even the resilient segment, which is highly dependent on oil-based plastic resins, saw only a 7.0% rise in material costs which translated to a 6.0% increase in resilient flooring prices. Despite this increase, resilient flooring remains the lowest cost flooring material on average (not installed). These are four industry trends I uncovered in 2011. Are you seeing these trends play out in your business? Do you think there are other reasons for the growth in hard surface?